Late this afternoon a Bulls pitcher faces an interesting challenge: He will come to the mound and it will be the bottom of the 3rd inning, two outs, bases loaded, and a one ball, two strike count on the Toledo batter. Just how nutso was it for the umps to let it get to that point? But, it is what it is. Tune in. 5:30. By the way, the score is 1-1. If I understand the way this works, they will have to play out the 9 innings, then follow it with a 7-inning game. So might as well roll out updates to my charts. It sure looks like Charlotte is in charge. The Bulls have six games against the Knights (4 at home, 2 away) before season’s end, but the Knights are looking very good for the championship. 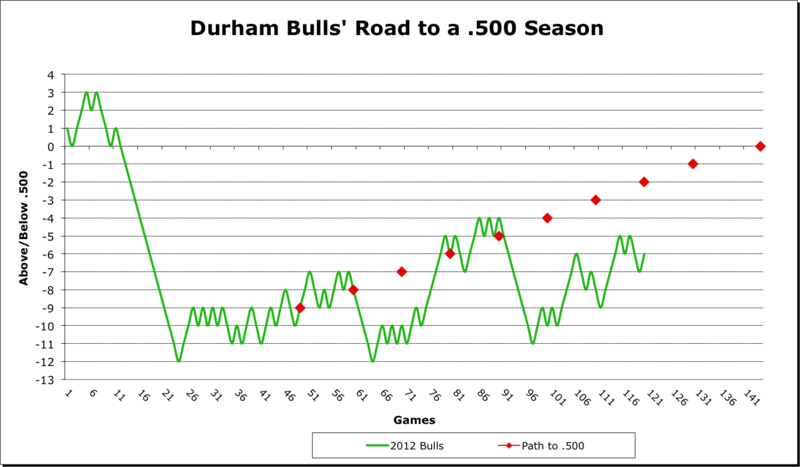 When we first came up with this chart in late May, .500 seemed a reasonable goal for the Bulls. Not so much now. 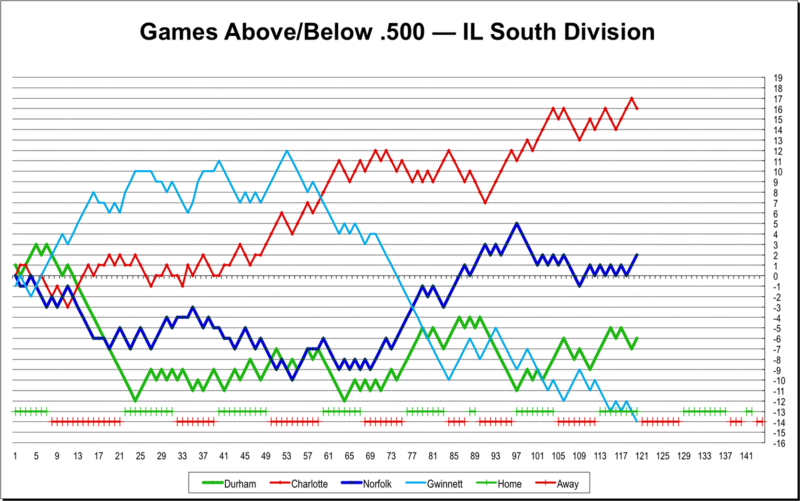 The Bulls have come back a bit from their early July slump, but it doesn’t look like it will be enough. 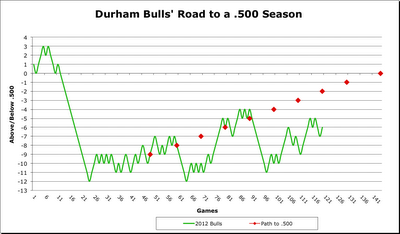 To reach .500, the Bulls need to win 15 out of the remaining 24 games. That is, they need to play .600+ ball to reach .500. A year ago Matt Torra was pitching well. Russ Canzler was doing his MVP thing. Tim Beckham had just come up from Montgomery. Two years ago I was complaining about the heat. Three years ago Elliot Johnson, Chris Richard, Jon Weber, and Justin Ruggiano were in fine form.